We invite you to discover the riches of Promenade at Hunter’s Glen Apartments in Thornton, CO. Our pet-friendly community boasts the best in apartment features, all with a lake view. One, two, and three bedroom apartment homes for rent have been recently upgraded with sophisticated designer finishes and modern conveniences. 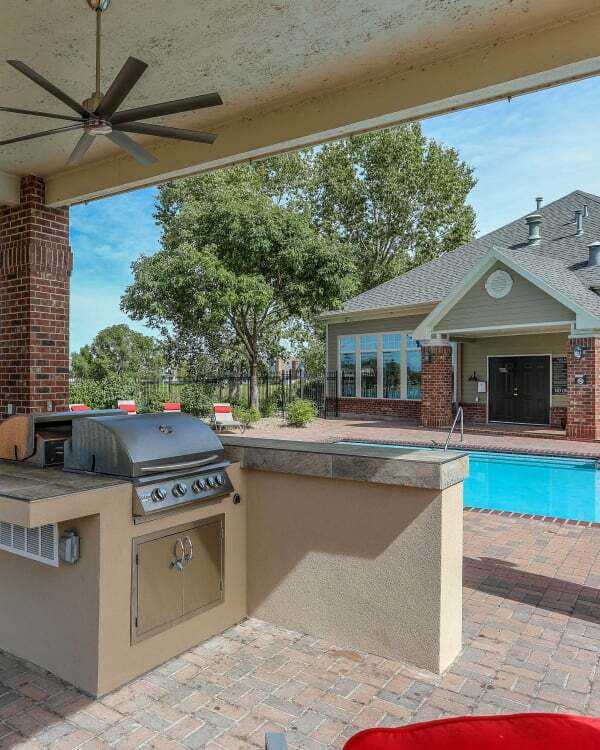 Promenade at Hunter’s Glen Apartments include a full-size washer and dryer, central air, and private balcony or patio. You can choose to rent a private garage, as well. High ceilings, open floor plans, and generous layouts allow you to create your ideal home. Our designer kitchens feature stainless-steel appliances, custom cabinetry, and a walk-in pantry. You’ll enjoy the easy-to-clean wood-style flooring in the living area and bathroom. Lush carpet welcomes you into the bedroom. Central air, ceiling fans, and gas heat keep your apartment at the right temperature year-round. Enjoy the best view in town, right outside your front door. Promenade at Hunter’s Glen Apartments is situated right at Hunter’s Glen Lake and is minutes away from the park. The mountains are also visible from our property and select homes, too. Our charming community features outstanding amenities for the whole family. The resort-like property features a large swimming pool, hot tub, outdoor lounge, and playground. You don’t need a gym membership when you live here. Our 24-hour fitness center has modern cardio and weight equipment, and comes with a view of the lake. Promenade at Hunter’s Glen Apartments has an on-site bark park with fun equipment that your dog will love. Take advantage of the benefits of our clubhouse. You can check email in the business center, have packages delivered, and get to know your neighbors in the relaxing lounge area. We also offer 24-hour emergency maintenance assistance. All this and so much more is available to you at Promenade at Hunter’s Glen Apartments. We look forward to introducing you to our stunning neighborhood. Enjoy lakeside recreation and relaxation, just north of Metro Denver. View our available apartment homes for rent and schedule your personal tour today.